Bitcoin Investment Trust is an open-end fund that tracks the performance of bitcoin. That performance has been disastrous in 2018, which begs the question "hodlers" everywhere are asking: Where will Bitcoin Investment Trust be in 5 years? If you clicked on this article, you were almost certainly expecting a prediction for the price of Bitcoin Investment Trust (NASDAQOTH:GBTC). Unfortunately, the article can offer no such prediction, and there is a very good reason for that: In my view, within the next five years, the Bitcoin Investment Trust will no longer exist, as the trust sponsor, Grayscale Investments, will have shuttered it. What is the Bitcoin Investment Trust? Bitcoin Investment Trust, which I'll refer to below by its ticker, GBTC, is an open-end investment trust with the objective of reflecting the price performance of bitcoin, minus fees. GBTC invests only in bitcoins; when you purchase one share of the trust, you become the owner of 0.00099063 of a bitcoin (as of the end of November). Note that this fraction must decline over time, as the trust will regularly sell some of its holdings in order to pay itself a lavish 2% per annum "sponsor's fee." It's been carnage in the cryptocurrency complex in 2018. 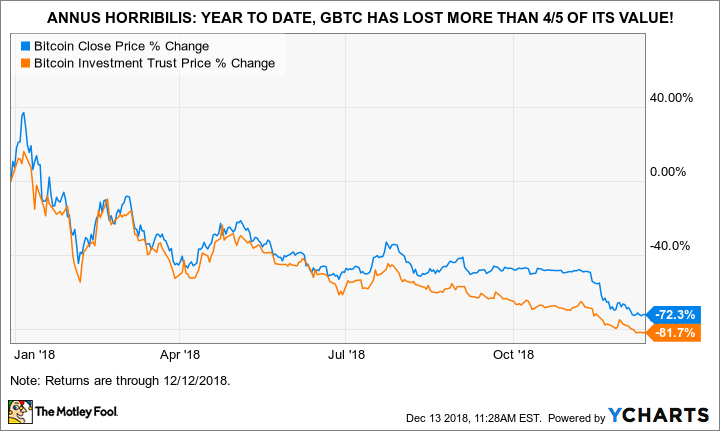 The following graph speaks for itself: GBTC has suffered brutal losses this year -- worse even than those of bitcoin. Essentially all new buyers of GBTC over the past 18 months who continue to hold the fund today are sitting on a loss on their position. At 2.00% annually, Bitcoin Investment Trust's "sponsor's fee" is extraordinarily high. Bear in mind that this is an index product that aims only to track bitcoin's performance. For reference, the 0.04% expense ratio of the Vanguard S&P 500 ETF is one-fiftieth of GBTC's fee. Even the SPDR Gold Shares expense ratio of 0.40% is just one-fifth. It would be entertaining to hear Grayscale Investments try to explain why a supposedly frictionless digital currency is more expensive to trade and store than a physical metal. Fees instantly gain visibility in a savage bear market, particularly when they are egregious. Speculators don't even think about a 2% annual fee during the "moon rocket" phase of a speculative bubble, but requiring one to pay 2% to an advisor for the privilege of seeing one's capital go up in smoke is adding insult to injury. As of Nov. 30, GBTC has $826.3 million in assets under management; on that basis, Grayscale's annual fee would still amount to a tidy $16.5 million. 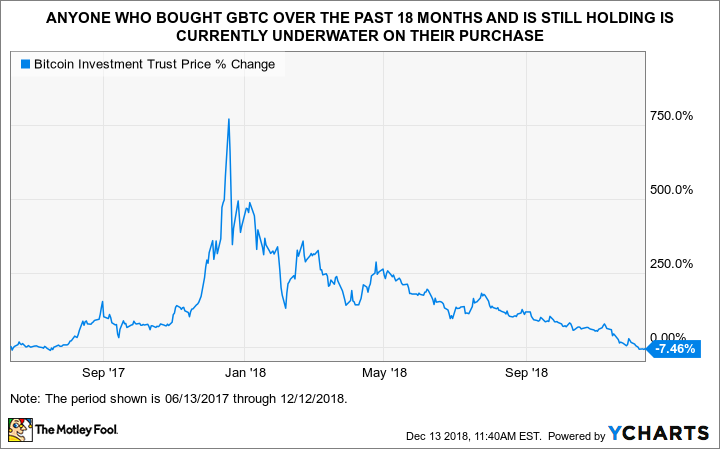 However, GBTC's assets are certain to continue plummeting over the coming months and years, thanks to two interrelated factors: fund outflows and further declines in the price of bitcoins. Fund outflows will result from the losses mentioned above and those still to come as the price of a bitcoin gravitates back to its intrinsic value: zero. Why am I certain that bitcoin is ultimately going to zero? Because the digital currency confers no rights to any assets or cash flows, and it has no practical application other than as a speculative vehicle. Buying a bitcoin today is not much different from paying $3,500 for an empty Starbucks card in the hope of finding someone who will buy it from you at a premium. When will Grayscale Investments close GBTC? Given the rich fees that Grayscale Investments is earning on the Bitcoin Investment Trust, we can expect it to resist closing the fund until doing so is inevitable. At some point dwindling assets will mean that even a 2% annual fee is uneconomic. There is no way of knowing precisely when this will happen, but five years should be more than enough time for the process to play out. As I see it, this is all the more certain as Grayscale's business represents an "all in" bet on digital Beanie Babies...err, currencies. It's a self-described "trusted authority on digital currency investing," and all of its funds relate to digital currencies. As the air continues to leak out of the cryptocurrency bubble, Grayscale's narrow franchise will pay a heavy price for its dependency on a broken economic paradigm.